Preheat the oven to 400°F. Grease or use cooking spray on a baking dish that is 15X10 inches or bigger. Unroll the dough in the dish and starting from the middle, apply pressure to the dough to form the shape of a rectangle. Bake the dough for 10-14 minutes or until its nice and golden-brown. Place the peanut butter evenly across the hot dough. Add the chocolate chips and peanuts. You can use your imagination with the colorful pieces of chocolate or add and remove ingredients as you like. You can also make the pizza round if you like. Today I have a little treat in the form of pizza. It's not only easy to prepare, but also incredibly delicious. You won't be able to resist! 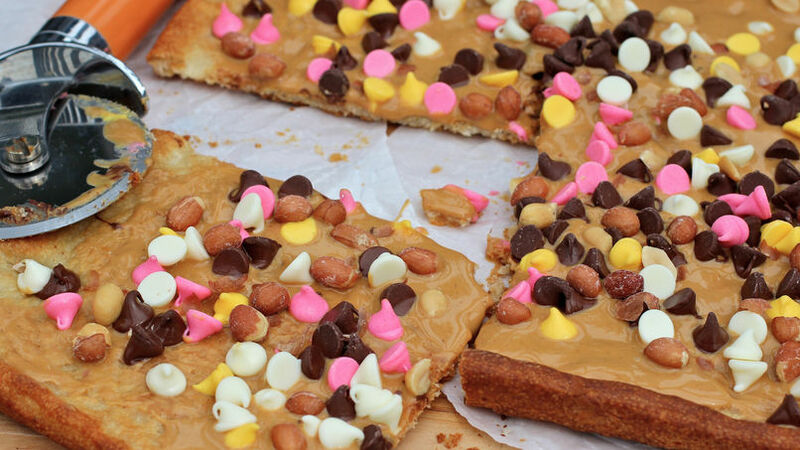 This peanut butter and chocolate pizza is ideal for children's parties or for Children's Day. This recipe has the perfect combination of two ingredients everyone loves: peanut butter and chocolate. My kids love dessert pizzas, so we've enjoyed preparing it often. Why not? This recipe is perfect for adults and kids a like. I hope you enjoy it!